Female Wave of Change welcomes Asmau Benzies Leo as our Ambassador in Nigeria. Female Wave of Change is happy to welcome Asmau Benzies Leo as our Ambassador for the North Eastern part of Nigeria. Since Nigeria is a huge country with a lot of challenges we are already finalizing the announcement of Helen Olayinka Ogunsuyi, as Ambassador Nigeria in the South western part of the country. Asmau Benzies Leo is an Ambassador of Peace and Humanity from Nigeria. She is a Vital Voices Fellow, a Gender Advocate and a Women’s Right Activist. She is the President and Founder of the Centre for Nonviolence and Gender Advocacy in Nigeria (CENGAIN), a non-profit NGO that works towards the achievement of peace, gender equality and sustainable development. She holds a bachelor’s Degree in Sociology and Anthropology and a Master’s degree in Conflict Management and Peace Studies, from the University of Jos and a Certificate in Global Executive Leadership from the prestigious Howard University in the United States of America. She was among a group of young Nigerians who struggled hard for the return of Democracy in 1999 after several years of Military Dictatorship in Nigeria. She was selected among 50 young emerging leaders in 2002 from across the 6 Geo-political zones in her country to serve as the first cohorts of Legislative Interns at the National Assembly for two months by the National Democratic Institute for International Affairs(NDI). Asmau have worked with various youth and women groups at community levels across Nigeria through the Community Peace Advocates (COPA) Project which has helped to build trust and restore peace and confidence between former adversaries in Christian and Muslim communities. She has served as a Consultant to several UN Agencies and other Development Partners. Due to her outstanding track records, she was recommended to serve as Head, Gender and Vulnerable Group Care Unit, with the National Emergency Management Agency (NEMA) under the Presidency. She currently works in the area of Disaster Management and humanitarian response to displaced women, children and other vulnerable groups affected by Bokoharam insurgency in Northeast Nigeria. She is a member of the Advisory Board on the Implementation of the National Action Plan on UNSCR1325, Women, Peace and Security in Nigeria. An International Conference Speaker, a certified trainer with over 15 years of experience. 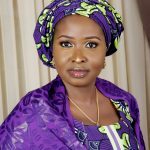 She is the convener of Peace Hub-Nigeria’ an online campaign on the engagement of young people in building a culture of peace and nonviolence in Nigeria and a true believer in the Nigerian Dream.